The presentation layer of the StrataFrame Application Framework has been designed with both the end user and the developer in mind. Not only are the included controls functional and user-friendly, but they are also quickly configured and easily extended. In tune with the developer friendly nature of StrataFrame, the presentation layer contains a full complement of "Zero Code" bindable controls. Through the forms designer, the developer can easily select the business object source and binding information through type editors (pull down menus in the property sheet). All binding is bidirectional regardless of the method of change: user-input or programmatic. When a change is made to a bound control its corresponding business object will be updated and vice-versa. StrataFrame data-binding is six times faster than standard ADO.NET data binding to custom controls. This functionailty is provided through the Business Object Mapper and the strong-typed properties. Binding to a property versus a data row is natively faster. But to achieve extremely fast binding, a field property descriptor is dynamically created for each field property which eliminates the need for reflection and provides all of the information required by .NET when binding to data. Since no reflection is used and all of the field property descriptors are compiled within the assembly, forms instantiate much faster. This is especially important for forms that will house a large number of bound controls. Populating a list can be one of the most tedious and time consuming tasks for any developer. StrataFrame’s class library contains several list controls that allow for “Zero Code” list population. Its proprietary list editor enables the developer to select the source for the list: business object type or enumeration type. Additionally, the display attributes of the list (sorting, filters, etc.) 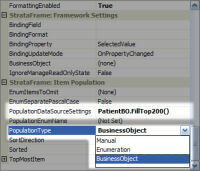 can be selected via the editor in order to direct the actual list population. Moreover, the developer is not even required to manually populate the data source. An error form is displayed when a Database exception occurs. The.NET error provider is automatically displayed when business rules are checked. A list of soft data collisions is presented to the user for resolution when a concurrency exception occurs. A delete confirmation window is displayed when a record is deleted. Note: Any automatic feature that exists on the presentation layer can be disabled if the developer does not want to use it. The framework does not force the developer to “Program around” any of the automation. StrataFrame provides a collection of controls referred to as Themed controls. Some of these controls are shown in more detail below. In addition to extending the developers control arsenal past the standard .NET toolbox, many of these controls also support the StrataFrame application themes. These themes provide a fresh and attractive appearance to any application with practically no effort! The framework comes with a number of pre-built themes that can be used by setting a single property. When set, the Themed controls recognize that a theme has been applied and render based on the active theme. There are a number of different effects that can be applied to the themed controls including glass-effects and refracted light. A pre-built theme named "BlackIce" is included out-of-the-box which follows the Windows Vista appearance. The StrataFrame application themes do not use bitmaps or any external configuration files in order to apply a theme to a control. All themed controls have properties that allow such effects as glass and gradients to be rendered. When a theme is applied to an application, these properties are dynamically set by the theme. This is important because controls will render much faster at run-time using this approach rather than using configuration files or bitmaps. Additionally, fewer resources are consumed as more controls are added to a form, thus adding to the performance. All StrataFrame components which provide pre-built interfaces, such as Role-Based Security, Browse Dialogs, and Maintenance Form Toolstrips are pre-localized out-of-the-box. This includes all labels, tooltips, messages, broken rules, and anything that displays text to the end-user. StrataFrame uses its own localization engine to localize the runtime components. StrataFrame provides the ability to use embedded XML files within an assembly which will be automatically loaded into the localization cache when the assembly loads. This requires absolutely no code whatsoever on the part of the developer and will automatically follow the applications selected language. Below is a list of the available languages which are pre-translated. When developing commercial applications, the standard .NET collection does not meet the needs of the normal developer. StrataFrame has extended the standard .NET controls to provide expanded functionality, but more importantly, provides many exclusive controls to meet the aesthetic and functional needs of an application. Below are just a few of the extended controls that are ready to use out-of-the-box. All StrataFrame controls have functionality to tie into the Windows Themes used by the end-user. This functionality can be over-written by the developer, but provides a user interface that is pleasing to the eye. If the end-user changes their Themes, by default, the StrataFrame controls will follow suit and adjust to the new colors. One function that all application developers need is the ability to provide an interface to their end-users to search and retrieve data dynamically. The Browse Dialog allows a developer to create a search dialog by simply dropping a control on a form and setting a few properties. The dialogs can also be classed allowing a common browse dialog to be reused in an indefinite number of locations. The Browse Dialog also has a feature called the Information Panel. The information panel is ultimately a user control that allows a developer to place any type of information, such as a patient photograph or record details that would be difficult to show in the results list. 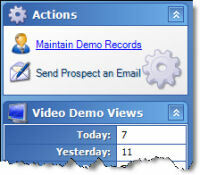 The Maintenance Formm Toolbar is a toolstrip that is "pre-wired" for business object interaction. This control just needs to be dropped on the form and will immediately work with the business objects without writing a single line of code. The Maintenance Form Toolstrip allows records to be created, modified, deleted, navigated, saved, and undone. Additionally, a Browse Dialog control can be associated with the toolbar and it will automatically launch and manage the Browse Dialog. The Maintenance Form Toolstrip can even be dropped on a StrataFrame User Control to provide isolated and classed support when forms need to be dynamically created. In addition to the automated features, the developer can easily control which buttons will appear and how the toolbar should behave by simply setting properties. The Gradient Form Header is a dockable control that is generally displayed on the top of a form and provides a very attractive banner. The Gradient Form Header will follow the Windows Themes unless the gradient colors are over-written by the developer. Additionally, an image can be associated with the header and has support for shadowed text. This control really provides a balanced and aesthetically pleasing appearance to a form. The Child Form Dialog is a revolutionary approach to dealing with shared data between multiple forms. The Child Form Dialog control is a component that is dropped on a form. By simply setting two properties, the child form will be instantiated and displayed when the ShowDialog method is called. This allows the developer to drop a business object on the child form, and when called, all references, even those in code, will be translated to the business object on the calling form. This allows a new child record to be created on the calling form and when the child form displays, the new record will appear as though it had been created on the child form. For developers coming from a FoxPro background, this is the answer to a default data session. 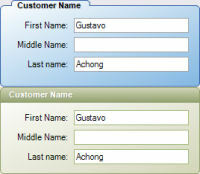 It allows business objects (or tables) to be shared across forms without any programming. The Wait Window was spawned from a feature available in Visual FoxPro. It is a threaded component that displays a Windows Theme colored window at a specified location on the screen, generally the upper right corner. The Wait Window has been vastly improved over the VFP predacessor with support for a title in addition to the message as well as threaded and animation support. A common use for a Wait Window is a quick and easy progress indicator to notify the end-user of the current state of a task. This is a great control to have in the developers bag of tools. The Themed Group Box is a replacement for the standard group box. As the name implies, the control will adjust colors to the end-users active Theme. Additionally, there is extended functionality which includes tabs, blocked headers, gradient color support, and more. Ironically, .NET does not provide native functionality for data binding to a group of radio buttons. The radio group box allows a group of radio buttons to be associated with a single bound value. Create beautiful and functional wizard forms quickly and easily with the Wizard control. Simply drop the control on a form create pages. There is support for welcome, content, and setup style pages. Moreover, the pages can even be classed and reused over and over again. The programmatic support is unsurpassed and allows the developer to completely control the order and display of the pages at design or run-time. There are events that notify the developer of the end-users interaction which gives complete control. For example, if the end-user did not complete the page and attempted to move forward, the developer could stop the progress and notify the end-user of the corrections that need to be made. The wizard control also has native support for dynamic interaction with a StrataFrame Progress Indicator control. The Progress Indicator control has extensive features that allows the developer to visually display the progress of a task. Use of this control is not exclusive to the Wizard control and can be dropped on any form that a visual representation of progress is needed. The Themed Container Control is also known as an Explorer Control. This type of control can be seen in the Windows environment in areas such as the control panel or explorer windows. The Themed Container control can be placed in a flow layout panel for web-style expand and collapse features on a windows form. In addition to Windows Theme support, header images, watermarks, and animation can be implemented on the control. Place any controls within the container and they will expand and collapse with the Themed Container. Every StrataFrame control is made bindable through the implementation of a single interface. 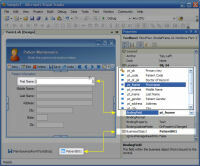 This same interface can be implemented by any developer to create a new bindable control for either WinForms or WebForms. Additionally, all ADO.NET components used within the business objects are exposed to allow the developer to bind to the business objects without using the StrataFrame interfaces. For example, advanced grids and views would be bound to the CurrentDataTable of a business object rather than to a specific field within the business object. StrataFrame provides a complete solution for Connection String Management. As such, there are times that the developer needs to directly call the Connection Manager dialogs to be presented to the end-user. The dialogs alleviate the pressures of the developer to produce server connection, language selection, and shared settings dialogs. Calling these dialogs is as simple as a single line of code to present the desired form to the end-user. There are four basic dialogs that include the Database Connection Wizard, Active Application Connections, Active Language, and the Shared Settings Wizard. Each dialog informs the developer of the selections made by the end-user so proper action can be taken. StrataFrame has a DevExpress and Infragistics wrapper that provdes integrated and native data binding and functionality. In addition to the standard DevExpress and Infragistics controls, all StrataFrame extended controls such as the Gradient Form Header, Browse Dialog, and Maintenance Form Toolstrip, just to name a few, have been written to support the wrapped skins and controls as well. Use the wrapped controls without losing any of the functionality of the standard StrataFrame controls. Extended functionality has been added to the DevExpress controls to add list population support as well as a replacement for the ListView control in the standard control collection. Infragistics already had a ListView control which was extended to support all of the native StrataFrame list population techniques. All text within an application created with StrataFrame is localizable without the use of satellite DLLs. Localized messages are stored by key within either the application’s database or within an XML file. Keys can be assigned to controls and the text then localized at runtime. All localizable text can be retrieved from the message-store programmatically by the developer. Generally it is difficult to prepare an application for localization support. StrataFrame is ready out-of-the-box to implement localization quickly and easily. Regardless of the translation approach that is taken, each control that is to be localized needs to be associated with a key that tells the control how to retrieve its display value at run-time. StrataFrame provides excellent design-time localization support allowing a key to be created straight from the control itself. Since most developers program the forms in their native language, this can be specified in the preferences and the key created will be automatically assigned to that language. 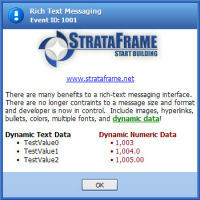 StrataFrame’s presentation layer contains a messaging interface that goes far beyond the MessageBox provided by .NET. A rich-text message form enables the developer to provide colorized and themed messages to the end-user. The message form can display text given at runtime, or can be called by passing the desired key to the framework; the localized message information is retrieved and used to show the form. In addition to rich text support, the messaging interface also support HTML. This is a great way to create dynamic display messages and present them with a rich look to the end-user. Many times there is a need to create a notification within an application that alerts the user in an unobtrusive manner. When this situation occurs, StrataFrame provides a messaging interface called an InfoBox which behaves and looks like the Office-Style notification windows. The window has animation support including fade and scroll. Additionally the developer can control the opacity and the placement of the window. An InfoBox window can appear within the Windows screen or be bound to appear within a form. Also, the InfoBoxes will automatically stack if more than one appears in the same location. On top of the Windows Themed appearances, the developer can specify error and tip windows. Also, an icon and a sound can be associated with the InfoBox. Last, a content menu can be assigned to the window allowing support for end-user actions to be made. 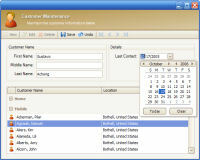 Bindable controls are provided for both WinForms and WebForms applications. The radio button group is a bindable control that allows binding to the entire group rather than requiring the developer to bind to each individual radio button. The Child Form Dialog opens any form as a child form and translates business objects between the parent form and the child form. This enables the developer to use the same business objects between a child form and a parent form. The GradientFormHeader is a themed header than can be dropped onto any form to add a graphical element to the form. The Themed Detail Window is a graphical Windows form that follows the user’s current theme and is the base used for the Message Form and Wait Window within the application framework. This class can be used to create accent forms. 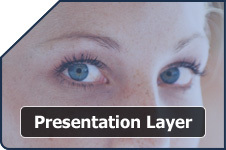 Several measures have been taken to ensure the optimized performance throughout the presentation layer. Data binding on business objects has been engineered to allow the business object to change the record pointer without requiring that the data binding be destroyed and re-created. Caching techniques are used extensively to improve performance; for example, localized text and messages are cached on the client side to reduce round-trips to the data store to retrieve the information. The auto-bound .NET error provider is fully customizable through the designer. All properties can be modified including the icon, blink rate and position. 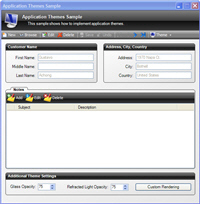 Templates are provided for all project and item types used within a StrataFrame WinForms application, WebForms application, or business object class library.